Koh Thonsáy (Khmer: កោះទន្សាយ) is a Cambodian island located off the country's southern coast in the Gulf of Thailand. "Koh Thonsáy" translates to Rabbit Island, it is being administered by Kep Province. Koh Tonsay is located just 4 km (2 mi) south of Kep town, has an area of around 2 km2 (1 sq mi) and can be reached by ferry boat from the local port. The island is open for visitors and tourists, who value white sand beaches and the marine scenery. The surrounding sea is shallow, the sea bed gradually sloping, excellent for recreational activities. A number of coral reefs and a variety of habitats for animals and plants attract researchers and ecologists. During Norodom Sihanouk’s Sangkum Reastr Niyum regime (1953 to 1970), the island was a rehabilitation center for convicted criminals, who were in turn used to defend the island. Horse cart paths and wooden, thatched roof hotels were also constructed during this time. Most of this infrastructure has been destroyed by weather and decades of war. Currently there are individually built and run guest houses on the main beach, attracting Cambodian and foreign tourists. Local settlers - fishermen and their families also live on the island, occupying other beaches around the shoreline. 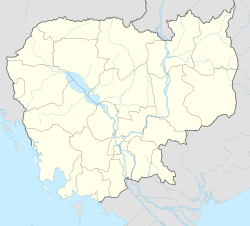 Tonsáy is derived from the word Rumsay (រំសាយ, engl. "discharged"). While trying to avoid the commander’s troops, Khmer prince Sakor Reach grew hopeless because his troops were exhausted. He led his remaining troops across the sea to an island in front of Kep city, where the troops spread out. Accordingly, the island was called Koh Rumsay( កោះរំសាយ), the name underwent a transformation towards Koh Thonsay(កោះទន្សាយ), as it is known today. ^ "List of Islands". Cambodia islands – Island Species Cambodia. Retrieved May 16, 2015. ^ "Koh Tonsay (Rabbit Island)". KepCity com. Retrieved December 28, 2015. ^ "រំសាយ - discharged (Rabbit Island)". Google Translate. Retrieved December 28, 2015. This page was last edited on 3 August 2017, at 08:34 (UTC).